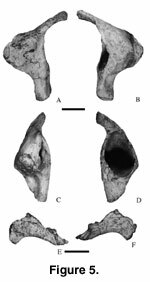 Malawisaurus is characterized by high-angled premaxillae; posteriorly broad, angled infratemporal fenestrae; short and divergent basipterygoid processes; dentary with 15 alveoli that extend two thirds the length of the element; thin splenial with a spenial foramen; broad but not spoon-shaped teeth with high-angled wear facets; undivided cervical neural spines and pleurocoels; cervical prezygapophyses extend beyond the anterior end of the centrum; presence of pre- and post-spinal laminae in distal cervicals; ribs in proximal and middle cervicals extend beyond the end of the succeeding centrum; elongate, eye-shaped pleurocoels on dorsal vertebrae; infradiapophyseal laminae of distal dorsals not forked; six sacral vertebrae; sacral neural spines fused into a dorsal plate that overhangs the neural arches; strongly procoelous proximal but platycoelous middle and distal caudals; proximal caudals with well-developed pre-spinal and post-spinal laminae; at least five V-shaped middle chevrons; and metacarpals with distal articular facets. Malawisaurus dixeyi was initially named Gigantosaurus dixeyi by Haughton (1928) who considered the specimen to be closely related to Tanzanian specimens that were referred to Gigantosaurus (Fraas 1908). However, this generic name was preoccupied so the generic name for the Tanzanian specimens was changed to Tornieria (Sternfield 1911). Without justification, G. dixeyi was referred to as Tornieria dixeyi. The generic name Tornieria was later changed to Janenschia by Wild (1991). The specimens from Malawi that passed through these generic name changes or were collected subsequently are from the same area and same rock unit appear specifically identical, but are distinct from Janenschia from older beds in Tanzania. Therefore, Jacobs et al. (1993) erected a new generic name, Malawisaurus, to accommodate the Malawi taxon. Early Cretaceous, Mwakasyunguti area, Karonga District, Malawi, Africa. Premaxilla. Except for the partial braincase that includes several bones, all cranial material was disarticulated. The right premaxilla (Mal-6; length = 45 mm; height = 65 mm; Figure 4A-B) with three unerupted teeth and four alveoli was briefly described by Jacobs et al. (1993, figure 1a). The body of the premaxilla is subrectangular in lateral view. The median symphysis is broad and oblique in medial view. The anterior margin of the premaxillary body rises nearly vertically from the dental margin in lateral view. The nasal process is narrow, anteroposteriorly flattened, dorsally oriented, and borders the large external naris anteriorly (Jacobs et al. 1993). The maxillary suture is tall and is immediately below the external naris. The premaxilla has a dorsal process and a dorsoventral groove ventral to the maxillary process that suggest the presence of a dorsoventral process of the maxilla. Maxilla. The maxilla (Mal-106; Figure 4C-D) is represented by a left anterior fragment with two replacement teeth present. The first tooth alveolus is 60 mm from the premaxilla-maxilla contact. The teeth are aligned nearly parallel to the anteroposterior axis of the preserved maxilla. Jugal. A right jugal (Mal-44; Figure 4E-F) is a small, thin (width = 30 mm; height = 120 mm) bone, similar to that of Camarasaurus lentus (Madsen et al. 1995, figures 1e and 6c) in lateral view. The quadratojugal process is mediolaterally flattened while the postorbital process is mediodorsally curved to accommodate the jugal process of the postorbital. The posterodorsal curvature of the postorbital process suggests that the jugal extended along the posterodorsal margin of the postorbital. The infratemporal fenestra is obtuse-angled anteriorly as suggested by the shape of the posterior margin of the jugal. Parietals. The parietals are small (left, Mal-202-2; length = 70 mm; Figure 4G-H; right, Mal-202-3; length = 67 mm). The supraoccipital and exoccipital articular surfaces are shallow depressions. The elements suggest that the supratemporal fenestrae are elongate mediolaterally. Both were found associated with the basicranium. Quadrate. The right quadrate (Mal-203; Figure 5A-D) is well preserved. The shaft is 160 mm high and nearly vertical. The head of the quadrate is rounded and is gradually inclined posteriorly. The posterior surface has a tall deep ovoid fossa (height = 70 mm; width = 50 mm; 45 mm into the pterygoid flange). The medial and lateral walls of the fossa are 5 mm thick. The fossa is at the dorsoventral midpoint of the shaft. The pterygoid process is centrally placed on the shaft, thin mediolaterally, and triangular in lateral view. The articular surface is suboval in ventral view. Ectopterygoid. A left ectopterygoid (Mal-215; Figure 5E-F) is incomplete. It is lunate in lateral view. The medial surface has a well-developed groove for the palatine bone while the lateral surface has a well-developed contact surface for the maxilla. Basicranium. The braincase (Mal-202-1; width at paraoccipitals = 140 mm; Figure 6) is represented by basioccipital, basisphenoid, exoccipital, laterosphenoid-orbitosphenoid complex, opisthotic, prootic, and supraoccipital. The bones are completely ossified, and their sutures are indistinct. The pituitary fossa is rounded and large. The canal for the optic nerve (II) is small, circular, and is directed anterolaterally. Posterior to the canal for the optic nerve, the rounded canal for the oculomotor nerve (III), and the trochlear canal for the trochlear nerve (IV) are found in sequence. The opening for the trigeminal nerve (V) is large and subcircular. A small notch on the laterosphenoid margin of the trigeminal canal probably carried the ophthalmic branch of the trigeminal nerve. Anterior and posterior grooves exit ventral to the canal for the trigeminal nerve. The anterior groove probably corresponds to the maxillary branch whereas the posterior groove corresponds to the mandibular branch of the nerve. Posterior to the canal for the trigeminal nerve is a small dorsoventrally elongate canal for the facial nerve (VII). In Camarasaurus, the trigeminal nerve and facial nerve openings are on the basisphenoid-laterosphenoid boundary (Madsen et al. 1995). Thus, these canals are assumed in Malawisaurus as delineating the basisphenoid-laterosphenoid boundary. The laterosphenoid is flat and projects laterally from the braincase wall. Ventral to the fenestra ovalis, in the middle ear region, is the metotic foramen (called the jugular foramen by Berman and McIntosh 1978) for cranial nerves IX to XI (glossopharyngeal, vagus, and spinal accessory nerves), and probably the jugular vein. The metotic foramen is mediolaterally narrow and elongate. The hypoglossal canal for cranial nerve XII is mediolaterally elongate. The foramen magnum is ovoid and higher (28 mm) than wide (20 mm). It is slightly larger than the occipital condyle. The occipital condyle is hemispherical but concave dorsally. With the basicranium (Mal-202-1) oriented with the supraoccipital vertical, which is considered the normal orientation (Salgado and Calvo 1997), the occipital condyle projects and faces posteroventrally, the paroccipital processes project anteroventrally, and the basipterygoid processes project ventrally. The paroccipital processes are long, anteroposteriorly flattened wing-like structures that curve ventrally, typical of titanosaurians (Powell 1986; Chatterjee and Rudra 1996). Posterolaterally, the paroccipital process has a ventrally directed depression for the quadrate articulation. The basal tubera are large and separated by a wide shallow depression. 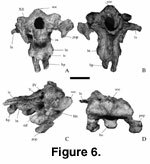 Salgado and Calvo (1992) interpret the fusion of the basal tubera in Amargasaurus (MACN-15) as reflecting rigid attachment for vertebral muscles. By inference, the separation of the basal tubera would reflect a less extensive muscle attachment in Mal-202-1. The opening for the internal carotid artery is at the base of the basipterygoid process. The basipterygoid processes are short (25 mm long) and divergent. In sauropods, short basipterygoid processes are associated with vertical quadrates, whereas long basipterygoid processes are associated with highly anteriorly inclined quadrates (Chatterjee and Rudra 1996). Dentary. The right dentary of Malawisaurus (Mal-174; Figure 7A-C) was briefly described by Jacobs et al. (1993, figure 1b, c). The preserved portion of the dentary is 252 mm long from the symphysis to the surangular notch. The dentary has a minimum of 15 tooth positions, including unerupted teeth in place. The tooth row is 159 mm long extending more than half the length of the dentary. The posteriormost tooth position is 23 mm anterior to the surangular notch. Replacement teeth are visible through three of the nutrient foramina. The rostral portion of the dentary appears linear due to crushing. The dentary is slender and 50 mm deep. The surangular notch is triangular with its apex pointing anteriorly. The notch divides the dentary posteriorly into a dorsal ramus and a ventral ramus. The dorsal ramus is small, short, and triangular in lateral view whereas the ventral ramus is large, long, and quadrangular. The splenial groove on the medial surface is broadly open posteriorly, tapering forward to close approximately below the eighth tooth position (Jacobs et al. 1993). Splenial. The element (Mal-284; Figure 7D-E) identified as splenial is thin (5 mm wide). A splenial foramen occurs on the anterior half of the element as in Mamenchisaurus (Russell and Zheng 1993). The posterior half of the element is separated into a long, slender ventral ramus and a short, broad dorsal ramus. Teeth. Jacobs et al. (1993, figure 1d) described teeth of Malawisaurus briefly. Some teeth are present in the jaws (Mal-6, Mal-106, and Mal-174), and others are isolated (Figure 7F-I; mesiodistal width, range = 06 to 09 mm; average mesiodistal width = 7 mm; labiolingual widths, range = 4 to 5 mm; average labiolingual width = 5 mm). The roots of the teeth are nearly cylindrical and circular in cross section. The crowns are nearly cylindrical at the base and become lingually flattened towards the apex so that the crown is less convex lingually than labially. As the crowns become flattened, faint distal and mesial ridges emerge. The crowns are broadest close to the tip of the teeth. The surface is rugose. Anterior teeth in the premaxilla and the dentary are similar in size but broader than more posterior teeth in the maxilla and dentary. The maxillary teeth (Mal-106) curve anterolingually. 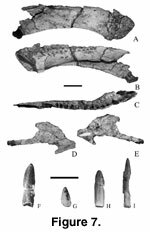 Compared with the premaxillary teeth, the maxillary teeth of Malawisaurus are mesiodistally narrower and smaller. The maxillary teeth are more cylindrical than the premaxillary teeth and closely resemble teeth generally associated with titanosaurians (Sanz 1985; Powell 1986; Lucas and Hunt 1989; Scuitto and Martinez 1994; but see Kues et al. 1980). Isolated teeth are assigned to Malawisaurus, because they have more convex labial surfaces than lingual surfaces, faint distal and mesial ridges, and crowns that are broader toward the apices of the crowns, and in all respects are similar to the teeth in the jaws of Malawisaurus. In having convex labial and flattened lingual surfaces, the teeth of Malawisaurus are like those of Nemegtosaurus (Nowinski 1971) and Quaesitosaurus (Kurzanov and Bannikov 1983). Anteroposterior decrease in tooth size and variability of curvature between anterior and posterior and between upper and lower teeth are features that are also present in Camarasaurus (Osborn and Mook 1921; Carey and Madsen 1972), Nemegtosaurus (Nowinski 1971) and Quaesitosaurus (Kurzanov and Bannikov 1983). In Mamenchisaurus (Russell and Zheng 1993), teeth diminish in size as crowns become more compressed.